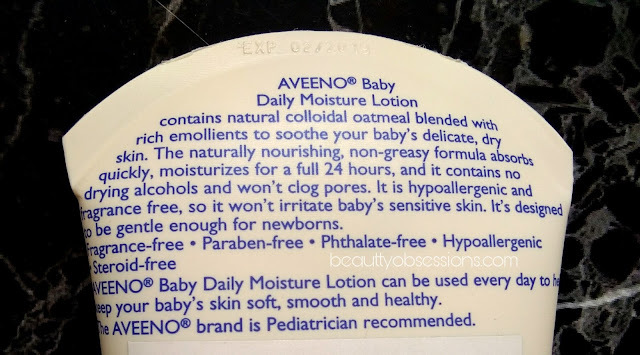 "Discover nature's secret for baby's healthy skin" , that's what the slogan by Aveeno and honestly I am loving the words... When I got the daily moisture lotion by Aveeno, I have some high expectations by seeing the claims.. Being a mom I always choose the best for my kid and every mom does the same.. Whenever I got any new baby product, I always try that on my skin before my son and after satisfying fully I use on his skin. We all know that baby's skin is more dry than us and sensitive too. It is always advisable to use natural ingredients rich products for babies and avoid harsh chemicals..
PRICE - Rs799/- for 227gm. 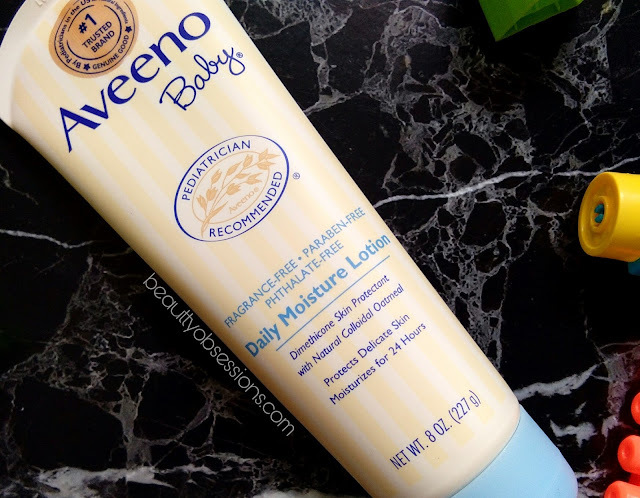 The Aveeno baby daily moisture lotion comes in a cute looking tube packaging with a flip open cap... 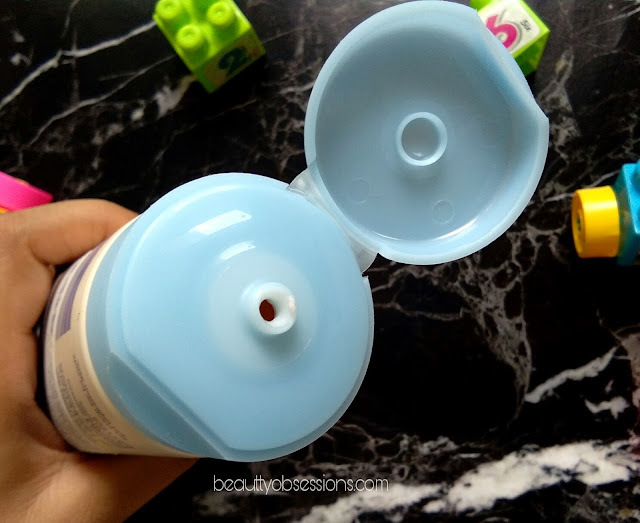 The cap locks tightly to make it leak-proof.. The sleek long tube is easy to carry while traveling.. All information is on the tube itself. I love the simplicity of the packaging... It is so eyesoothing.. The cream is white in colour and thick in consistency. The texture is soft and gelly kind. It spreads easily on skin and absorbs quickly without any effort. There is no fragrance but if you smell from very close, you can find a light hint of oatmeal fragrance which is again so soothing.. The cream is not sticky or greasy on skin after application. It keep moisturised my son's skin for longer hours.. I have also applied on my skin and it works equally great.. I apply post bath on the whole body including face of my son and it keeps hydrated his skin till afternoon .And again I apply at night before bed time and it keeps moisturised through out the night.. After using continuously for few days I can notice the changes on his skin texture... His skin is more softer and supple now.. 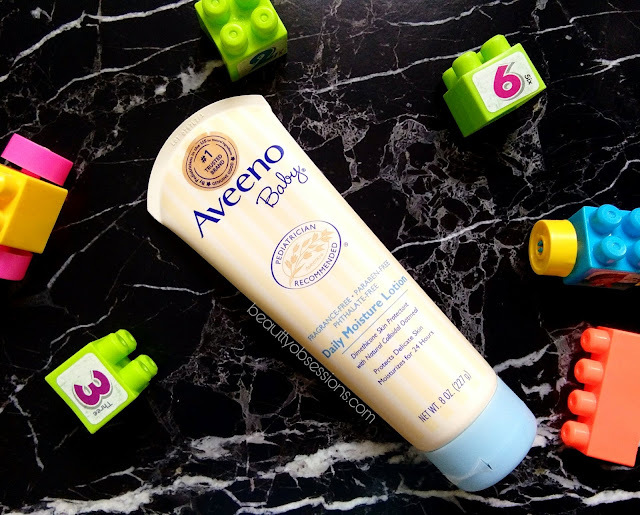 The aveeno baby lotion is paraben free, phthalate free, steroid free and has no drying alcohol.. It has Dimethicone skin protectant with Natural colloidal oatmeal which helps to sooth baby's dry skin. While purchasing from Firstcry, you can use the exclusive coupon code AVEENOBABYMJ to avail extra Rs100/- off on aveeno products ..
Hope you found this review helpful.. Share your thought in the comments below. See you in the next post..
* Sponsored post but my opinion is unbiased and honest.. I totally agree with your review of the product. Its worth every penny. I love Aveeno's body care range. This sounds like an amazing but gentle product for kids. This sounds like a great product for babies. Much needed in winters. Thanks for the review, Snigdha! I love your detailed review of this product. Would make everyone have an informed choice . Would love to try this out. I love using this body lotion on my baby now days, very moisturizing and nourishing.